Are you up for a creamy pasta dish for our ulam for tonight, Foodies? 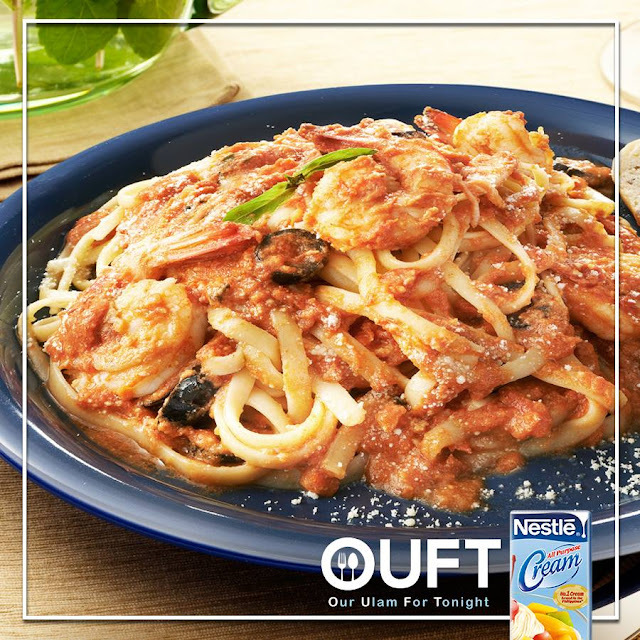 Here, try our Creamy Shrimp Pasta recipe and make tonight’s dinner more enjoyable for the whole family! 1. In a sauce pan, sauté shrimps in olive oil until half cooked. Set aside. 2. In the same pan, sauté bagoong and garlic until fragrant. Add in crushed tomatoes and half the basil. Season with salt, pepper and sugar. Simmer for 10 minutes. 3. Add in half the parmesan cheese and all of the olives and mix well. Add in the cooked pasta, prepared shrimps and Nestle All Purpose Cream. Mix well. 4. Serve the pasta with the remaining parmesan and basil as garnish.